I have been to a number of book readings in my day. They are usually fairly staid affairs. The author reads an excerpt using his or her best read-aloud voice, all the correct inflection, and just the right amount of feeling. The audience listens raptly, chuckling good-naturedly when appropriate, nodding respectfully in agreement at all the poignant parts, and otherwise just smiling attentively. When the reading is complete, the author takes questions. “Tell us about your method. Do you have a writing routine?” someone will ask. Or: “Who are your inspirations?” All in all, author readings are predictably calm affairs. This past Tuesday, however, I went to a very different kind of reading. B.J. Novak, of The Office and The Mindy Project fame, was in town. He is the author of One More Thing: Stories and Other Stories, which I reviewed in March, shortly after it was released. But this reading was to promote his new book, The Book with No Pictures , which came out last Tuesday. Not surprisingly, it was a packed house. But, unlike most readings I attend, the audience was made up of equal parts hipstery Emory students and . . . four-year-old children. 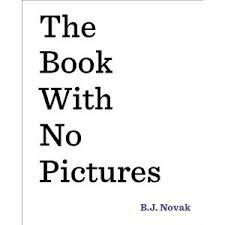 Did I fail to mention that The Book with No Pictures is a kid’s book? An especially precocious three-year-old asked, “Why did you call it The Book with No Pictures instead of The Completely Ridiculous Book that Kids Make Grown-Ups Read?” Novak replied, “My original thought was to call it something exactly like that, but then I thought adults might not want to buy that book and might prefer a more elegant experience instead,” gesturing to the stark and plain black and white book cover. Parents guffawed. Question: What is your favorite word? Novak: My absolute favorite word is pretty. It means so much and so little at the same time. It’s weightless and dismissive, and yet so many people would trade everything for that tiny word. If you put “pretty” in anything, even something like Pretty Little Liars—not that I watch that show, I really don’t—but if you put “pretty” in anything, it sounds good. Question: What was the best thing about writing for The Office? And that was that: a lovely evening with B.J. Novak . . . and a delightful break from the norm when it comes to author readings. Next time I go to a reading, I’m going to take a cue from these kids and interject at random intervals with loud and exuberant opinions on particular parts of the book. I’m pretty sure that will go over swimmingly. This entry was posted in Not a book review and tagged Author Reading, B.J. Novak, Books, One More Thing: Stories and Other Stories, The Book with No Pictures, The Office. Bookmark the permalink.